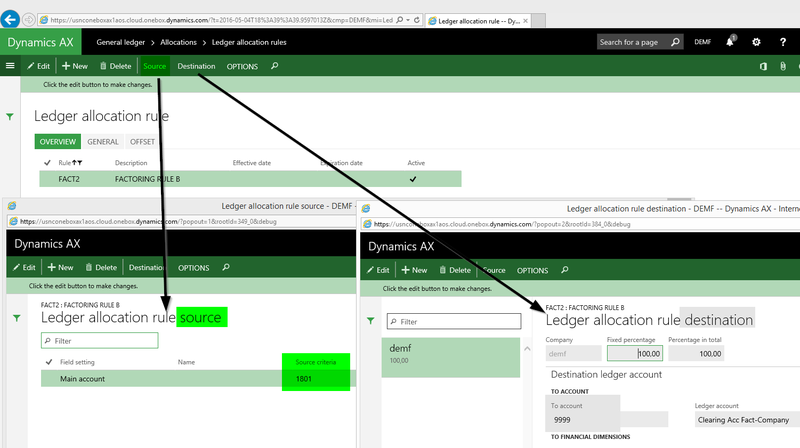 Within this post I want to demonstrate you the use of a shadow accounting system based on the example of silent factoring. What makes silent factoring special is the fact that a company sells its receivables, which consequently disappear from its books. At the same time the company still needs to manage and track the receivables and payments made by their customers in their (accounting) system. The following illustration summarizes the different process steps and postings in T-account form. Balance sheet accounts are illustrated in blue color, profit & loss (P&L) accounts in red color and shadow accounts in black color. The 4-digit main accounts used in this demonstration are shown in square brackets. The numbers shown next to the amounts recorded on the different main accounts refer to the process flow steps shown above. 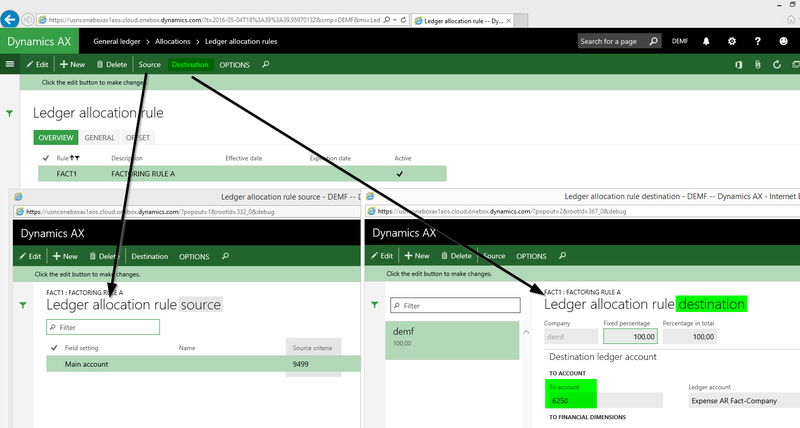 The process flow steps and the way how the shadow accounting books are illustrated in this blog do only represent one option how a shadow accounting system can be implemented in Dynamics AX. 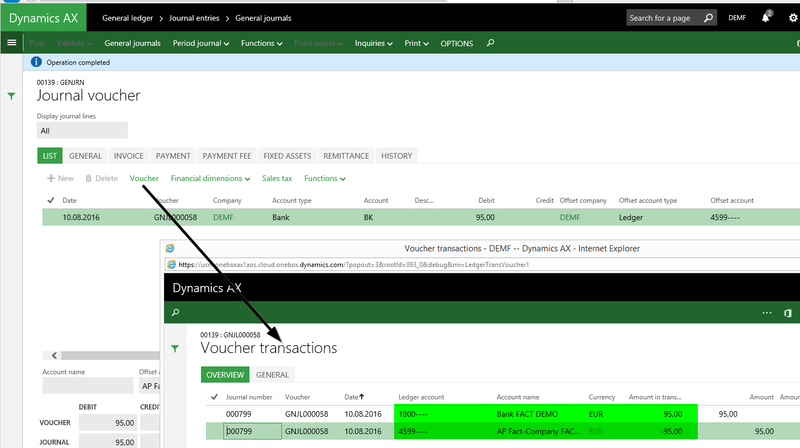 Now let’s have a look at the different transactions and the setup required in Dynamics AX to implement such a shadow accounting system. 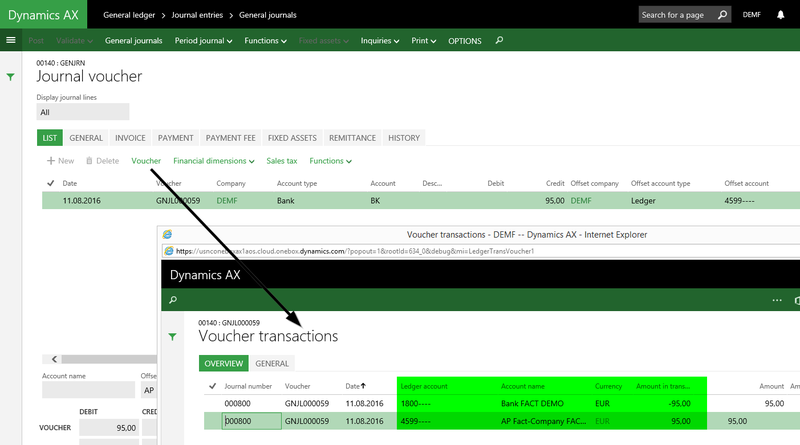 Initially, a free-text invoice for a total amount of 100 EUR is recorded in Dynamics AX. Recording this invoice generates postings on ledger accounts no. 1400 (Accounts Receivables) and ledger account no. 5000 (Sales revenue) within the original accounting books. The next process step involves the transfer of the open customer position to a dummy customer account. 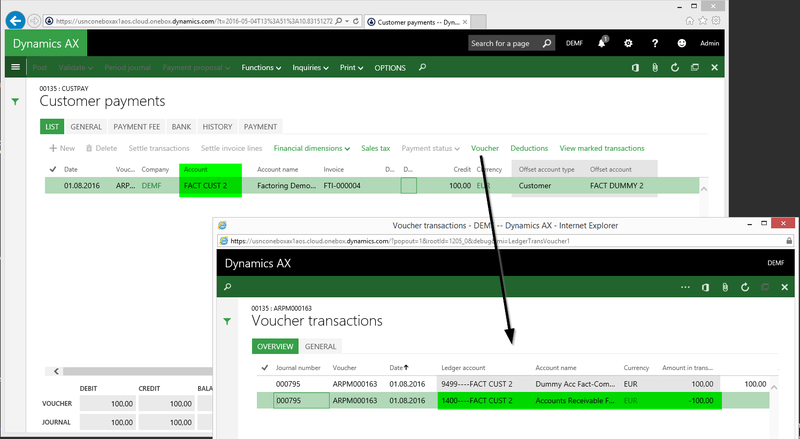 As the dummy customer account is setup with a summary account (no. 9499) that belongs to the shadow accounting system, the open customer position disappears from the company’s books. 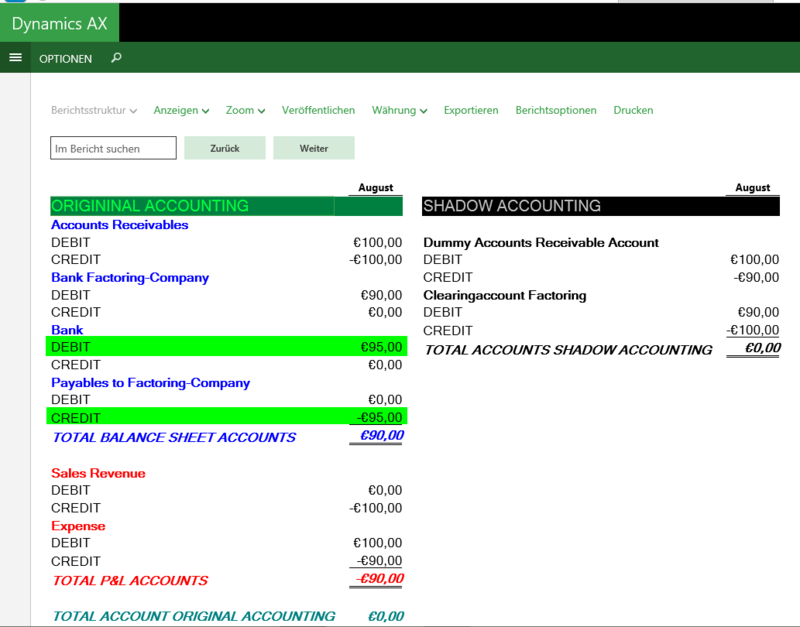 The transfer of the open customer position to the shadow accounting books can be identified in the next screen-print by the green and grey highlighted lines. 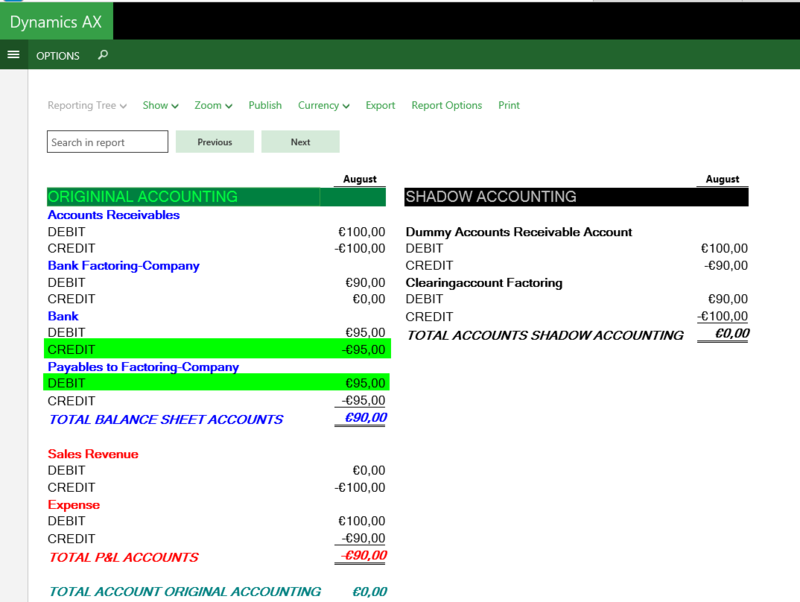 A detailed investigation of the accounts illustrated in the above screen-print shows that the original and shadow accounting books do not match. That is, the total of all accounts in the original and shadow accounting books do not add up to zero. 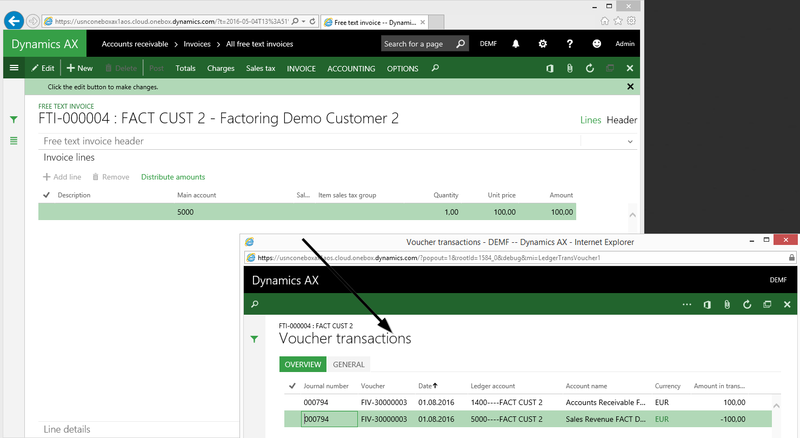 What is missing in the previous screenshot is an expense transaction that offsets the reduction in the open customer position (receivable). 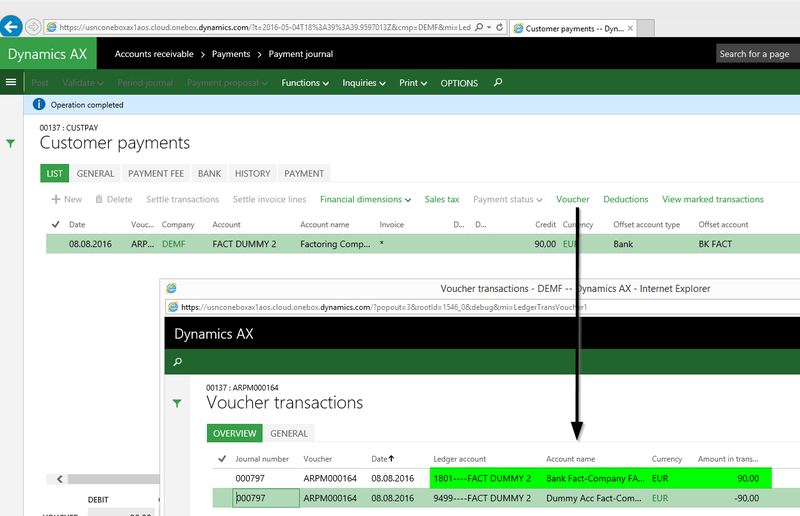 The same holds for the transaction that is recorded in the shadow accounting book. 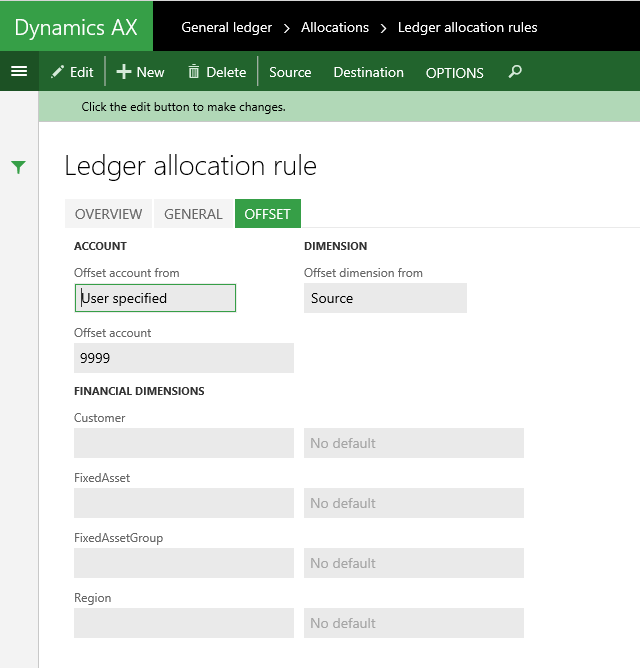 The source of the allocation rule are the transactions recorded on main account no. 9499, which is setup as the summary account for the transactions on the dummy (shadow) customer account. The same amount that is posted on account no. 9499 is also posted on main account no. 6250 (“destination”). The latter account is used for posting the missing expense transaction in the original accounting books. The offset account for the transaction generated is main account no. 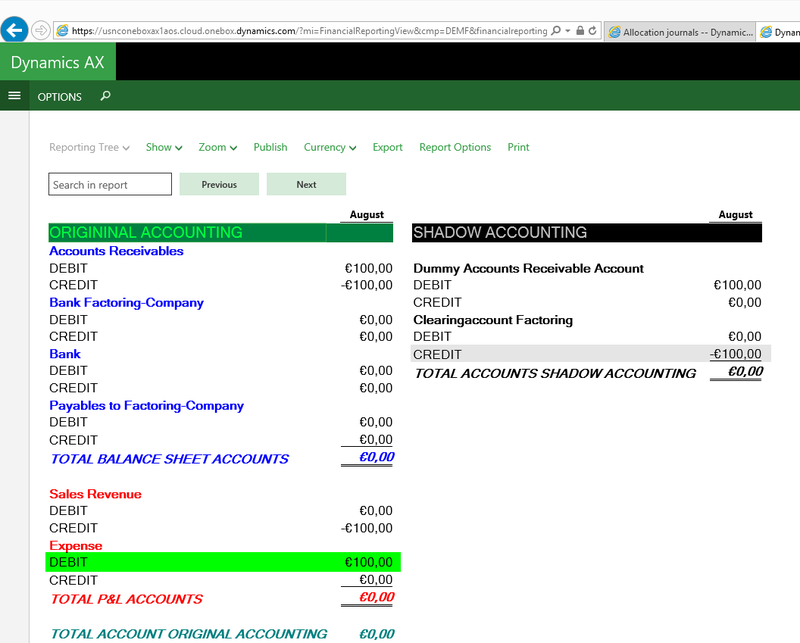 9999 from the shadow accounting system that ensures that also the shadow account book balance. … and the following account statement. 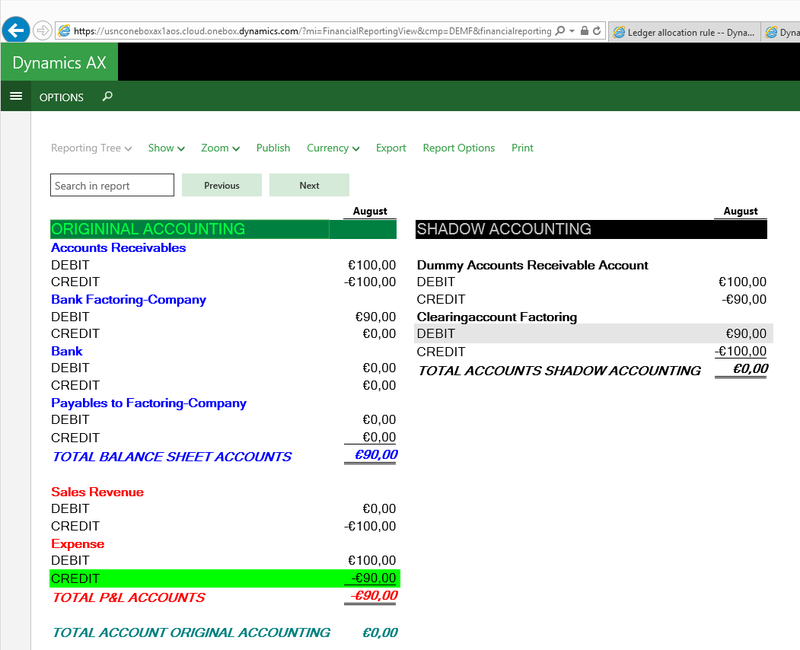 The screen-print above shows that the original and shadow accounting books are now balanced. The third process step is related to the receipt of the amount that the factoring company pays us for the sale of the receivable. In the example used, a total of 90 EUR is paid by the factoring company and posted on our bank account. 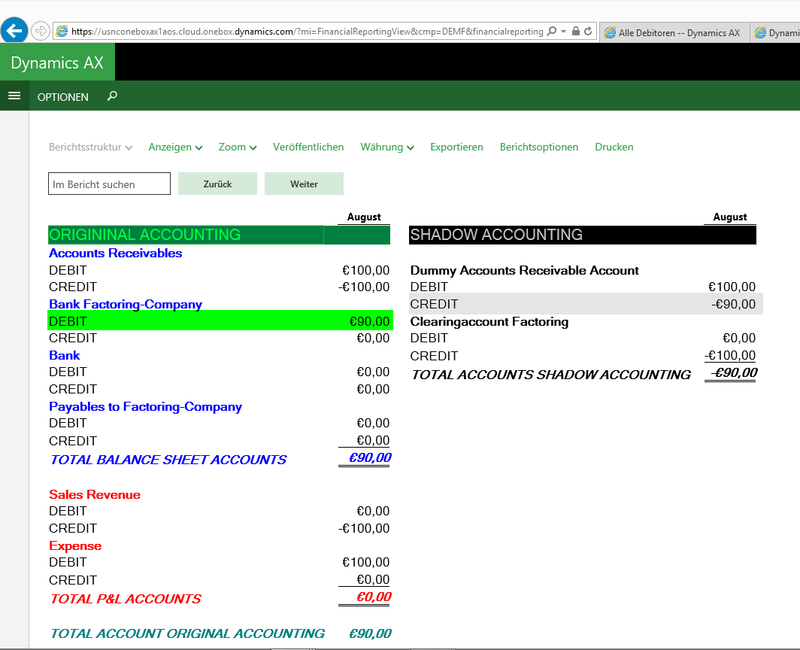 The offset account used is the dummy factoring account from the shadow accounting book. For details, please see the next screen-print. After recording the money received from the factoring company, the original and shadow accounting books do – once again – not balance and show a total amount of +90 EUR respectively -90 EUR. 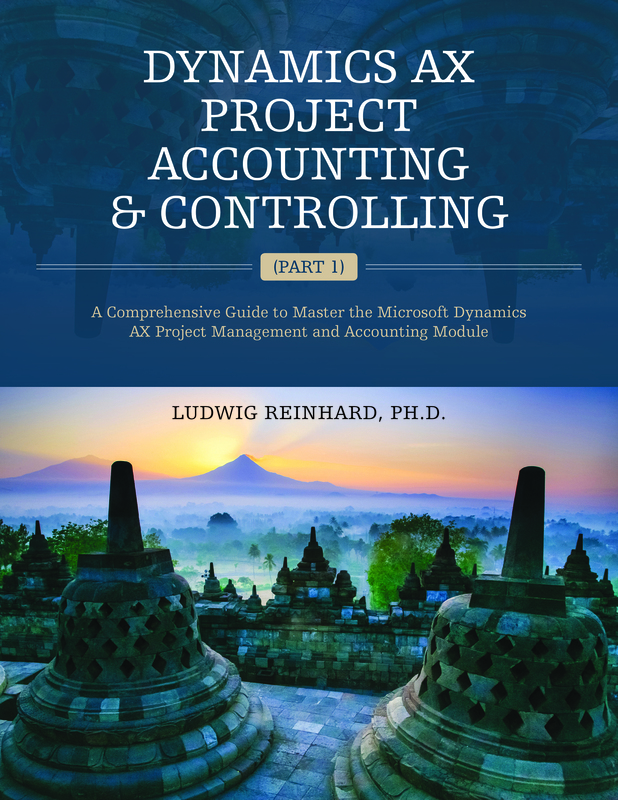 To align both accounting worlds – original & shadow accounting – another allocation rule is setup and processed. This second allocation rule uses the transactions recorded on the factoring bank account no. 1801 as the basis for generating a posting on the shadow clearing account no. 9999. The offset account is the P&L account no. 6250 that was already used in the first allocation rule before. That is because the receipt of the money from the factoring company does not only result in an increase of your bank account balance but does also require a corresponding offset P&L account transaction. Otherwise the expense amount of 100 EUR recorded with the first allocation rule would not correctly represent the “loss” (10 EUR) that we make from selling a 100 EUR receivable for 90 EUR. 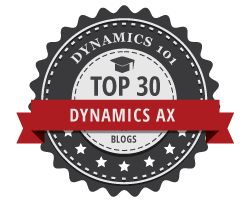 … that ensures that both accounting worlds do again balance. 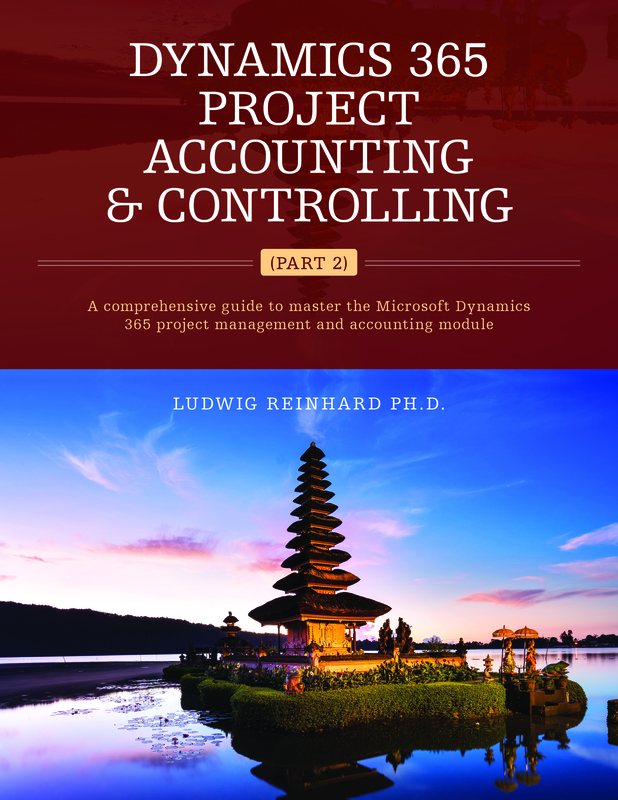 (Note: If you post the transfer of the open customer invoice to the shadow accounting books (step 2) and the payment receipt from the factoring company (step 3) at the same time, the setup and processing of the first allocation rule is sufficient to get the original and shadow accounting books balanced. 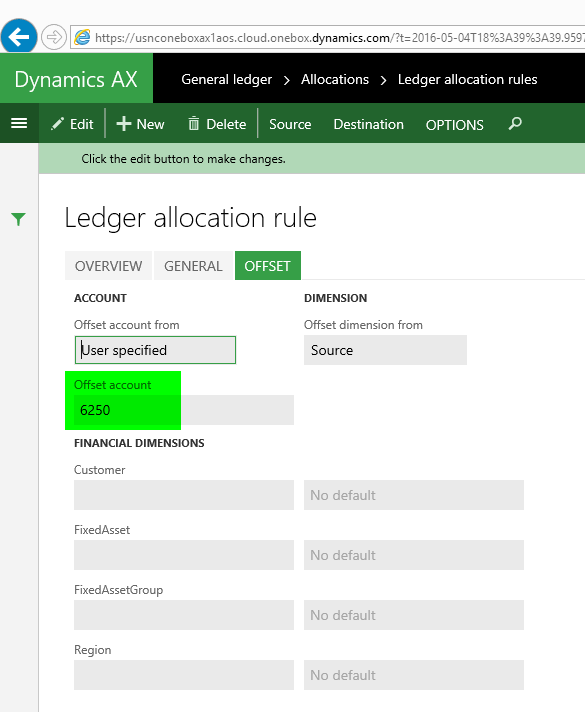 In the example used two allocation rules are required because of a timing difference between step 2 and step 3. Whether you will need to setup a single or several allocation rules thus depends on the specific organizational process flow in your organization). After a while the customer finally makes a payment of 95 EUR to our ordinary bank account. As we record this receipt on main accounts that do all belong to the original accounting book, both accounting worlds balance. The last process step involves forwarding the money we received to the factoring company. As this final transaction involves once again only accounts from the original accounting system, everything balances. For details, please see the next screen-prints. 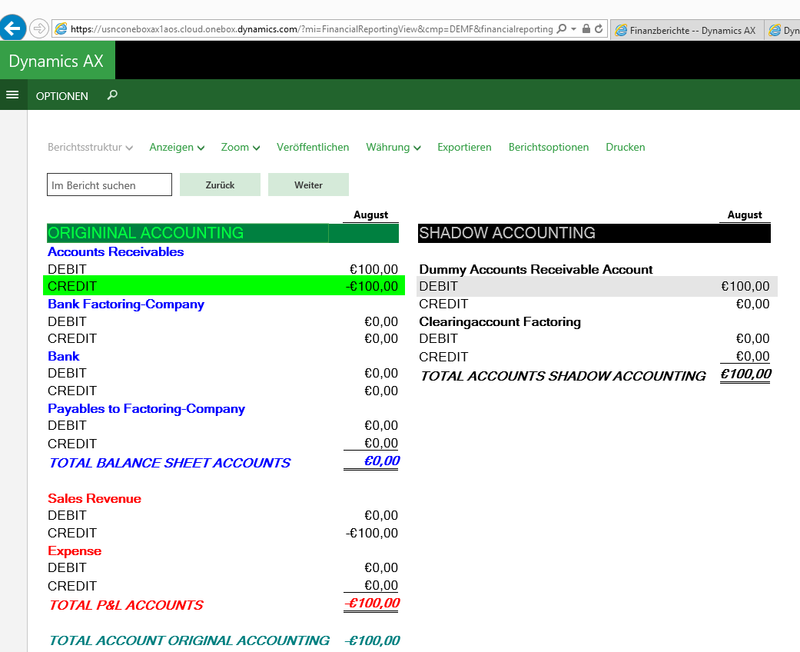 The shadow accounting example illustrated in this post can be used for several other accounting scenarios. The important thing to make this work is setting up and processing allocation rules. Whether one single allocation rule – that is processed e.g. at month-end – is sufficient or whether several allocation rules are required highly depends on your organizational process flows and time gaps that might exist between the different process steps.